Native Californian Justin Grant set a relentless pace for 25 non-stop laps Friday to earn his third career preliminary night win in as many years at the 33rd annual Chili Bowl Nationals in Tulsa, Okla.
Grant’s Vacuworx Qualifying Night victory around Tulsa Expo Raceway’s fifth-mile oval earned his fourth chance at Saturday night’s Golden Driller trophy. Runner-up Tanner Thorson also advanced into Saturday night’s A-Feature. 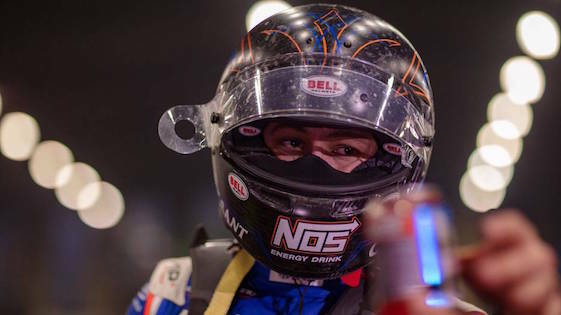 “This one was a lot of work,” said Grant, who started on-pole in the NOS Energy Drink No. 4a fielded by RAMS Racing. “I’ve been really fortunate to win some decent races and most of them have been showing up and walking in at three o’clock in the afternoon with my helmet bag and jumping in the car and just doing that and going home. This one’s been…it started with a truck, trailer and a credit card _ and a lot of 12-, 14-hour days leading up to this _ a ton of work. Grant jumped to an early advantage but Thorson began closing as traffic came into play on Lap 12. Using slower cars as picks while trying to navigate heavy traffic, the pair ducked high and low at both ends of the track. Setting up to challenge on Lap 18, Thorson came up short as Grant worked a lapped car into the equation. With the slower machine cleared, Thorson again set up the attack as Grant slid off the bottom with five to go. But Grant slammed the door heading into Turn 1 to edge out the win by 0.168-seconds. With his first-second place finish of the week in the book, 2019 VIROC winner Thorson will make his fifth start Saturday night aiming to best his fourth-place result of the past two years. Chad Boat recovered from a spin in his Qualifier to race the No. 84x into the final podium spot. Fourth went to NASCAR Cup regular Ricky Stenhouse Jr., with Tucker Klaasmeyer in fifth. Alex Schutte, with Daryn Pittman in tow, brought Dave Darland into eighth. Overcoming problems in his Heat Race, Spencer Bayston charged from the C-Feature to finish ninth. The night’s Hard Charger, the Indiana racer advanced 15 spots in the A-Feature and 34 positions overall. Grady Chandler completed the top-10. Through Friday night, 350 of 362 entries received have taken part in Preliminary Night competition. The Chili Bowl Flip Count stands at 49, with all drivers able to walk away. The Pizza Express Pole Shuffle will determine starting spots for Saturday’s top-10 drivers. Logan Seavey drew the No. 1 for Saturday’s Dash, which will take place after twin D-Features. Saturday’s “Alphabet Soup” will begin with Double O-Features. Saturday‘s first race is scheduled for 10 a.m. (CST). Opening Ceremonies for the week’s final events, which include C, B, and A-Feature action, is set for 6 p.m.
Heat 1 (8 Laps): 1. 21-Daryn Pittman, ; 2. 2G-Steve Buckwalter, ; 3. 1P-Terry Nichols, ; 4. 7CG-Jimmy Light, ; 5. 19M-Ethan Mitchell, ; 6. 55K-Nick Knepper, ; 7. 0-Johnny Murdock, ; 8. (DNF) 101-Chuck McGillivray, ; 9. (DNF) 21W-Waylon Weaver, . Heat 2 (8 Laps): 1. 17S-Ricky Stenhouse Jr., ; 2. 95-Chris Andrews, ; 3. 11P-Laydon Pearson, ; 4. 21R-Stevie Sussex, ; 5. 19U-Pierce Urbanosky, ; 6. (DNF) 99G-Skylar Gee, ; 7. (DNF) 19T-Kevin Thomas Jr., ; 8. (DNF) 14C-Danny Clark, ; (DNS) 8JR-A.J. Johnson. Heat 3 (8 Laps): 1. 84X-Chad Boat, ; 2. 47M-Austin Liggett, ; 3. 31K-Kyle Beilman, ; 4. 88N-D.J. Netto, ; 5. 59E-Dex Eaton, ; 6. (DNF) 37M-Matt Mitchell, ; 7. (DNF) 68S-Logan Scherb, ; 8. (DNF) 45L-Carson Short, . Heat 4 (8 Laps): 1. 5G-Grady Chandler, ; 2. 36-Dave Darland, ; 3. 73X-Shane Cottle, ; 4. 80-Josh Hawkins, ; 5. 10W-George White, ; 6. 10V-Landon Hurst, ; 7. 926-Morgan Frewaldt, ; (DNS) 27A-A.J. Burns. Heat 5 (8 Laps): 1. 9D-Sean Dodenhoff, ; 2. 86-Mark Lowrey, ; 3. 78X-Ray Allen Kulhanek, ; 4. 67Z-Kasey Kahne, ; 5. 57B-Chase Jones, ; 6. 18K-Mike Mehl, ; 7. 23M-David Budres, ; 8. (DNF) 97K-Spencer Bayston, . Heat 6 (8 Laps): 1. 27-Tucker Klaasmeyer, ; 2. 41H-Howard Moore, ; 3. 99W-Korey Weyant, ; 4. 1S-A.J. Flick, ; 5. 11G-Mike Goodman, ; 6. 28M-Ace McCarthy, ; 7. 20-Tadd Holliman, ; 8. 87C-Danny Smith, . Heat 7 (8 Laps): 1. 17R-Alex Schutte, ; 2. 4A-Justin Grant, ; 3. 15X-Lance Bennett, ; 4. 10B-Kyle Bellm, ; 5. 83B-J.B. Gilbert, ; 6. 22A-Andy Malpocker, ; 7. 93M-Scottie McDonald, ; 8. 1X-Cody Lampe, . Heat 8 (8 Laps): 1. 54L-Luke Icke, ; 2. 2A-Brent Beauchamp, ; 3. 05-Brad Loyet, ; 4. 118-Scott Evans, ; 5. 5S-Kyle Steffens, ; 6. 95T-Brandon (Buddy) Tubbs II, ; 7. (DNF) 7D-Michelle Decker, ; 8. (DNF) 14H-AJ Hopkins, . Heat 9 (8 Laps): 1. 3C-Tanner Thorson, ; 2. 4J-Tim Crawley, ; 3. 51J-Hunter Schuerenberg, ; 4. 21H-Ty Hulsey, ; 5. 23L-Lee Lengel, ; 6. 68B-Blain Petersen, ; 7. 72X-Chris Tarrant, ; 8. (DNF) 71G-Damion Gardner, . C-Feature 1 (12 Laps): 1. 28M-Ace McCarthy, ; 2. 37M-Matt Mitchell, ; 3. 22A-Andy Malpocker, ; 4. 21H-Ty Hulsey, ; 5. 45L-Carson Short, ; 6. 68S-Logan Scherb, ; 7. 59E-Dex Eaton, ; 8. 0-Johnny Murdock, ; 9. 101-Chuck McGillivray, ; 10. (DNF) 68B-Blain Petersen, ; 11. (DNF) 5S-Kyle Steffens, ; 12. (DNF) 72X-Chris Tarrant, ; 13. (DNF) 926-Morgan Frewaldt, ; 14. (DNF) 20-Tadd Holliman, ; 15. (DNF) 14H-AJ Hopkins, ; (DNS) 1X-Cody Lampe; (DNS) 8JR-A.J. Johnson. C-Feature 2 (12 Laps): 1. 19T-Kevin Thomas Jr., ; 2. 97K-Spencer Bayston, ; 3. 95T-Brandon (Buddy) Tubbs II, ; 4. 10V-Landon Hurst, ; 5. 23L-Lee Lengel, ; 6. 10W-George White, ; 7. 19U-Pierce Urbanosky, ; 8. 7D-Michelle Decker, ; 9. 71G-Damion Gardner, ; 10. 99G-Skylar Gee, ; 11. 93M-Scottie McDonald, ; 12. 14C-Danny Clark, ; 13. 87C-Danny Smith, ; 14. 18K-Mike Mehl, ; 15. 21W-Waylon Weaver, ; 16. 23M-David Budres, ; 17. (DNF) 27A-A.J. Burns, . Qualifier 1 (10 Laps): 1. 36-Dave Darland, ; 2. 21-Daryn Pittman, ; 3. 17S-Ricky Stenhouse Jr., ; 4. 10B-Kyle Bellm, ; 5. 21R-Stevie Sussex, ; 6. 99W-Korey Weyant, ; 7. 51J-Hunter Schuerenberg, ; 8. 67Z-Kasey Kahne, ; 9. (DNF) 2A-Brent Beauchamp, ; 10. (DNF) 31K-Kyle Beilman, . Qualifier 2 (10 Laps): 1. 17R-Alex Schutte, ; 2. 5G-Grady Chandler, ; 3. 54L-Luke Icke, ; 4. 19M-Ethan Mitchell, ; 5. 11P-Laydon Pearson, ; 6. 84X-Chad Boat, ; 7. 86-Mark Lowrey, ; 8. (DNF) 11G-Mike Goodman, ; 9. (DNF) 15X-Lance Bennett, ; 10. (DNF) 80-Josh Hawkins, . Qualifier 3 (10 Laps): 1. 3C-Tanner Thorson, ; 2. 2G-Steve Buckwalter, ; 3. 9D-Sean Dodenhoff, ; 4. 73X-Shane Cottle, ; 5. 27-Tucker Klaasmeyer, ; 6. 41H-Howard Moore, ; 7. 57B-Chase Jones, ; 8. 1S-A.J. Flick, ; 9. (DNF) 78X-Ray Allen Kulhanek, ; 10. (DNF) 55K-Nick Knepper, . Qualifier 4 (10 Laps): 1. 4A-Justin Grant, ; 2. 88N-D.J. Netto, ; 3. 47M-Austin Liggett, ; 4. 95-Chris Andrews, ; 5. 05-Brad Loyet, ; 6. 1P-Terry Nichols, ; 7. 4J-Tim Crawley, ; 8. 83B-J.B. Gilbert, ; 9. 7CG-Jimmy Light, ; 10. (DNF) 118-Scott Evans, . B-Feature 1 (15 Laps): 1. 51J-Hunter Schuerenberg, ; 2. 05-Brad Loyet, ; 3. 99W-Korey Weyant, ; 4. 1P-Terry Nichols, ; 5. 37M-Matt Mitchell, ; 6. 11G-Mike Goodman, ; 7. 22A-Andy Malpocker, ; 8. 21H-Ty Hulsey, ; 9. 31K-Kyle Beilman, ; 10. 4J-Tim Crawley, ; 11. (DNF) 80-Josh Hawkins, ; 12. (DNF) 83B-J.B. Gilbert, ; 13. (DNF) 21R-Stevie Sussex, ; 14. (DNF) 78X-Ray Allen Kulhanek, ; 15. (DNF) 57B-Chase Jones, ; 16. (DNF) 28M-Ace McCarthy, . B-Feature 2 (15 Laps): 1. 10B-Kyle Bellm, ; 2. 73X-Shane Cottle, ; 3. 19T-Kevin Thomas Jr., ; 4. 97K-Spencer Bayston, ; 5. 41H-Howard Moore, ; 6. 67Z-Kasey Kahne, ; 7. 11P-Laydon Pearson, ; 8. 10V-Landon Hurst, ; 9. 7CG-Jimmy Light, ; 10. 15X-Lance Bennett, ; 11. (DNF) 95T-Brandon (Buddy) Tubbs II, ; 12. (DNF) 86-Mark Lowrey, ; 13. (DNF) 1S-A.J. Flick, ; (DNS) 2A-Brent Beauchamp; (DNS) 55K-Nick Knepper; (DNS) 118-Scott Evans. A-Feature (25 Laps): 1. 4A-Justin Grant, ; 2. 3C-Tanner Thorson, ; 3. 84X-Chad Boat, ; 4. 17S-Ricky Stenhouse Jr., ; 5. 27-Tucker Klaasmeyer, ; 6. 17R-Alex Schutte, ; 7. 21-Daryn Pittman, ; 8. 36-Dave Darland, ; 9. 97K-Spencer Bayston, ; 10. 5G-Grady Chandler, ; 11. 9D-Sean Dodenhoff, ; 12. 54L-Luke Icke, ; 13. 88N-D.J. Netto, ; 14. 19T-Kevin Thomas Jr., ; 15. 95-Chris Andrews, ; 16. 51J-Hunter Schuerenberg, ; 17. 47M-Austin Liggett, ; 18. 19M-Ethan Mitchell, ; 19. 2G-Steve Buckwalter, ; 20. 73X-Shane Cottle, ; 21. 99W-Korey Weyant, ; 22. 1P-Terry Nichols, ; 23. 10B-Kyle Bellm, ; 24. 05-Brad Loyet, . Lap Leader: Justin Grant, 1-25. Hard Charger: Spencer Bayston, plus-15.